Camper® is not just a shoe, but the result of the Mallorca family dream. Making shoes since 1877, the Mallorca family dream combines the original artisan roots with an industrial vocation. Not only does this Mediterranean dream stand for a way of doing, living and feeling, it's a dream that has taken Camper on a walk across the world! Camper offers a variety of products as the direct result of a commitment to creativity. The shoes are comfortable, useful, functional and versatile. 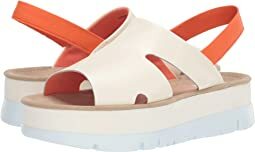 Camper makes shoes for walking, but at the same time, Camper makes shoes for imagining, for innovation and fun, with a clear Mediterranean flavor, as creative and original as human beings. From one side of the world to the next, Camper will forever represent a family with a dream. Doing, living, feeling. I have slightly narrow feet, and this shoe was too wide for me. Not by much, but as leather tends to stretch, I know from experience it wasn't a good fit. I liked the shoes, as I live under the illusion height will make me look thinner! Ha. 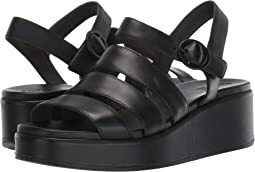 These, however, felt like flat shoes on my feet. There is very little lift on the heel, which made it feel flat. Nice shoes, but not a good fit for me! I do think they were true to size and width. It's my foot that isn't! The sandals are very cute. 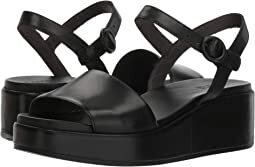 There isn’t much arch support, but they are comfortable enough. The only trouble is that the buckle is hard to operate, but if you fold the leather strip, it gets through. 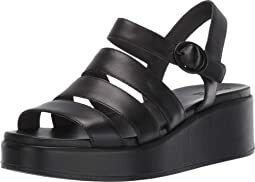 I like the style of this shoe because I have a narrow foot and need the elastic straps to keep sandals on my feet. 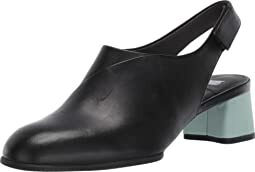 This Camper shoe runs a whole size shorter than my usual size, even shorter than other Camper shoes I have in the same size as this one, but the next size was too big overall. I'm keeping them and hope they will work. I found them comfortable wearing them indoors. This is my 2nd pair of these shoes and they are adorable! Camper shoes run short and are usually too wide for me, but this style hugs my foot because of the elastic laces and softness of the leather. I would prefer they came in half sizes, but this works okay in this style. 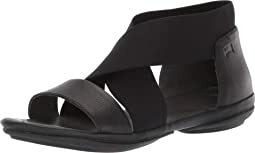 They are actually very comfortable and I can wear them for hours without a problem, even while on my feet and walking around. I saw the reviews suggesting that these shoes ran small, so instead of ordering my usual 9.5, I ordered a 10. It was not nearly enough: these shoes were so tight in every dimension I could barely get my feet all the way into them. They felt like 8s or 8.5s. So I am not sure a 10.5 or even an 11 would have sufficed. Other than that, the shoes were exactly what I had expected and hoped for: a nice balance between cuteness and comfort. (Or at least they *seemed* like they would have been comfortable, had they not been cutting into my feet!) Given how small they were, I boxed these back up about three minutes after I took them out to try them on: no way were they going to work. These shoes are darling! Just don’t work with my feet. I need support, so I sent them back. I am so thankful for Zappos, that I’m able to shop from the comfort of my home! I LOVE Zappos! Thank you!! The Morrys are sized in Euro sizes and I ordered a 44 (which is normal for me). A true 44 is about a size 11. I can wear a 10.5-11 in US sizes without much issue. Theses were fine and if you're a 10.5, the 44 will fit just a smidge on the generous side. Mine are black and the style is, well, a tad funky in a good way. I would call this an "unstructured" shoe - they are not stiff AT ALL - in fact, glove soft. They have an elastic lip on the heel for the shoe which is uber soft and comfortable. If you need support and rigidity, this shoe is not for shoe. 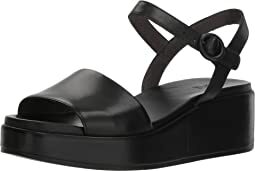 No arch support - look elsewhere, but the are great for me. Leather is very high quality and the shoe is light. The look is more on the Euro side than American, but they are very attractive in my opinion (wife likes them too). They look good with jeans or chinos, perhaps with dress pants, though the blue stripe on the sole points to a little more casual application. Really like the shoes. Start with the fact that I have feet that are difficult to fit -- short and wide. I have worn Campers before and I loved them. On these, though, the part that went between my toes on the right foot was very painful. I did not think it was something that I would get used to after a while. I have to return them. Again - I wish this shoe came in half sizes. I know this shoe would have been the one if it had fit. Sigh. A little clunky in design. The top leather is soft but the overall quality seems cheap - glued on sole. Blue heel is fun but the material seems to be the kind that once it’s scuffed it’s scuffed forever. Not for me and returned. Made in Vietnam. I love these! I can't believe how cute they are, but also so wearable. I wore them all day right off the bat. 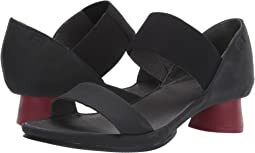 I bought them to replace those terrible ballet flats that seem comfortable for the about first half hour - then kill your feet because there's absolutely zero support. These are dressy and look great with pants and dresses. I am thrilled! Bought a pair of these a few years ago but did not wear them on a regular basis at all. Soles recently just tore up on one of them just with normal wear. Fun and functional shoe! The natural-shaped toe box and sole of this ballet flat make them superb for all day, more ergonomically sound wear. The placement of where they fall on the ankle and the elastic lacing add perfect details. Would buy these again and again. I clicked "true to size" and "true to width," but that only applies when you know Camper sizing, where a 42 is a US 10. The Twins loafers in gray were so cute, I wish they had fit. I like the soft leather and the flat sole, but these were just a little loose, as if already stretched and going to stretch further. I wish Camper could get its sizing act together! Smaller than usual, where a 42 in Camper is usually a 10. In this case, even the 42 was too small for me. I really wish Camper could get their sizing to be more consistent across models, and translated properly into US sizes. Further, even if they HAD fit, these sandals were not comfortable. I thought the elastic would be ideal, but instead, it rubbed with every step. I returned these. I agree with a previous reviewer that there is no arch support. Actually for me I felt there was no support whatsoever. I tried using a sole insert to add a little support, but it wasn't enough for me. I think for someone who doesn't need so much structure in a shoe this would be a good pick. They are super cute and simple, which I liked. I can see how people would love these. 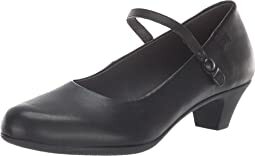 Very comfortable ballet-like shoes and it seems like the leather would soften beautifully. Even so, they felt a little too small in the toe box for me to risk getting and then not wearing. Thanks, Zappos! I have been wearing it to work pretty much everyday for the last 3 weeks. They are comfortable to be in all day. The sole feels soft, which is good. The leather feels soft and supple, which is also good. Overall I'm very satisfied with the style, quality, fit and feel. This is my 3rd pair of Right Nina shoes...so obviously I love them!!! The leather is super soft, but sturdy enough to standup to daily use. The quality is great and definitely worth the price. 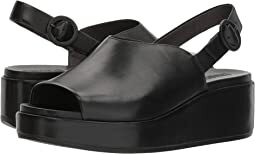 The soft leather lets the shoe conform to your foot shape, which is really nice for me because I have a tailor's bunion on one foot, so these do not constrict that foot or rub on the bunion. 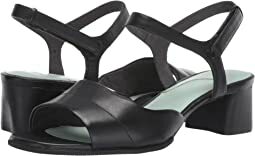 I've never gotten blisters in these, which is shocking because I get blisters from many flats either because of my ankle bones being really low and hitting the top edge of most flats or having a narrow heel. I love that these look nice and also have enough support for extended periods of walking/standing (travel, commuting, standing at my standing desk, etc). They do run a little small: I'm usually a 39 and in these I wear a 40. THESE WERE PERFECT, SO SOFT LIKE A SLIPPER. ORDERED A 6 BUT TOO SMALL. KEPT THE 37 SIZE AND THESE WERE PERFECT. I AM BETWEEN A 6 AND 7, SO HAPPY THE 37 WAS MADE FOR ME. Fun shoes. The lacing up to the ankle gives them their pizazz and the light weight provides nice support/sole for walking. The best, stylish and practical. This is the exact style I've been looking for. Minimal profile with covered heel. Seeing many reviews claim they fit narrow feet, I just knew they would work. Unfortunately they are a big fail. I'm normally 8.5, preferably Narrow in flats, but can get away with Medium width in most brands. I ordered 39, which says its a US 9. They were slightly too short and way too wide. My first 3 toes hung over the edge just enough to be obviously too small, and my feet swam in them the entire length. If they came in 39.5N they would be perfect. They felt like they would be very comfortable and prefect for travel and everyday.